Put the saffron threads in a large, wide, heavy-based pan over a moderate heat and stir constantly until they just begin to give off their aroma. Add the stock and bring to the boil. Remove the pan from the heat, cover and set aside to infuse. Heat 1 tbsp of the oil in a frying pan. Add the monkfish pieces and quickly fry on all sides until lightly browned. Remove the fish and set aside. Add the remaining 1 tbsp oil to the pan. Add the garlic, onion and paprika and cook over a moderate heat for 2 minutes, stirring occasionally. Stir in the red peppers and continue cooking for about 3 minutes or until the vegetables are softened but not brown. Stir in the rice so all the grains are well coated with oil. Bring the saffron-infused stock to simmering point and add half of it to the rice. Stir, then bring to the boil. Reduce the heat to low and simmer for 5 minutes or until the liquid is almost all absorbed. Add the rice mixture to the stock remaining in the large pan. Gently stir in the tomatoes with their juice, the peas and monkfish pieces. Arrange the mussels on the top. Simmer for about 5 minutes. Very gently stir in the squid, then simmer for a further 15 minutes or until the rice is tender and all the liquid has been absorbed. Season with salt and pepper to taste. 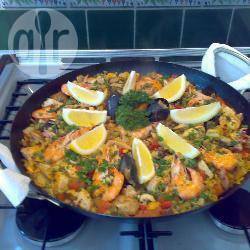 Sprinkle the top of the paella with the parsley and serve..